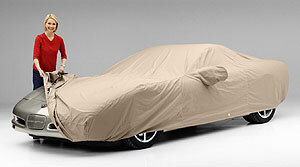 Home > Autogeek Gift Guide > Car Covers > Custom or Ready-Fit Car Cover? Custom or Ready-Fit Car Cover? Ready-Fit covers are designed to provide a very good fit using incremental sizing and a hatchback silhouette. While any of the almost 45,000 custom-patterned covers can be purchased by special order, you'll find Ready-Fit covers are pre-made and awaiting your order. Covercraft's program uses Block-It™ Series non-woven protection fabrics made by Kimberly-Clark in the U.S.A. The 200, 350, and 400 Series fabric covers offer different levels of protection to fit your needs and budget. Why a custom fit cover? Covercraft realized there were enthusiasts who wanted a more "perfect fit" for the cover being used to protect their pride and joy. Back in the 60's the most popular covers we made were for British and European sports cars and they were called "mittens". Today, custom covers are made for everything from kit cars to motor homes. Covercraft has over 55,000 listings in their computerized pattern library and add new patterns every week. The patterns are made to the exact specifications of any given vehicle. That means the cover will fit the vehicle for which it was ordered. Covercraft can even customize a custom cover. We can accommodate hood scoops, roll bars, grille guards, winches. You name it - they will custom make the pattern to fit any vehicle. Remember, if it has wheels - Covercraft can cover it!